A WEBSITE that inspires young people to foster farm safety has earned two North Galway children a prestigious People of the Year award. Aoibheann Mangan, 9, and Padraic Godwin, 10, are Fourth Class pupils at Cloghans Hill National School, who have developed a farm safety website to encourage children and their parents to stay safe on the farm. They received their award from Connacht and Ireland rugby star Robbie Henshaw at a glittering awards ceremony in Dublin on Saturday night as part of a live televised broadcast on RTE One. Their website, www.farmsafety4kids.net, is a mine of information to educate, inform and entertain children, while keeping them safe when out and about on the farm. The dynamic duo have already received high praise from a number of bodies who have endorsed their site, including the IFA, Teagasc, and the Health and Safety Authority. Aoibheann and Padraic will receive yet another accolade today (Wednesday) at Farmleigh House in the Phoenix Park in Dublin, where they will be presented with a Road Safety Authority Leading Lights award. Proud principal Iseult Mangan, who is also Aoibheann’s mother, said the pupils had brought great pride to the entire school community. 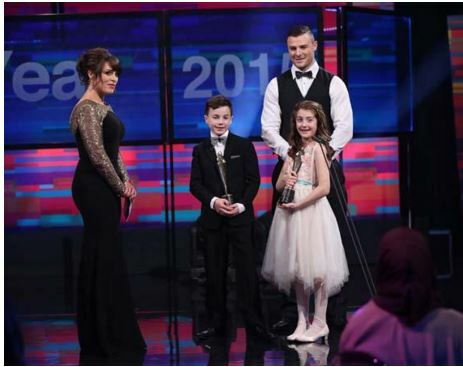 “We had a wonderful day last Saturday, where we attended a black tie ball which took place ahead of the awards ceremony that was broadcast from RTE’s studios in Montrose,” she said. “Both Aoibheann and Padraic were bouncing around with excitement, they weren’t fazed in the slightest and took it all in their stride. They were delighted to have their message of farm safety make it into the news. “We knew about the award since September, but we had to keep it top secret until the weekend and we’re very grateful to those who nominated the children in the first place. “It is so nice to know that the work we are doing in the school, which is keeping the children very busy during computer club each Thursday, is making a difference. They are constantly updating the site, they’ve uploaded a road safety video this week and are regularly posting information to their blog to keep it up to date. “The entire school is travelling to Dublin for the RSA award ceremony so it is wonderful recognition of the work being done in such a small school which is having a big impact. Article published in The Tuam Herald on Wednesday 9th December 2015. This page was added on 10/12/2015.